( 1 ) Update "Warning"Anybody offering a 3 or a 5 year health guarantee and a banana head, mentioned in there advertisement, be careful of these professional con artist!! They are the only ones that give a 3 or a 5 year health guarantee and are located on the east coast. There new line in there sales pitch is you can't trust anybody on the internet, True!! Especially them, There trying to hide from this page just like the Midsouth Conqueen. Brooklyn New York is the main location but now there are several other location's and player's and there all connected together and all are real Bad news. Just ask, Jordon and Blake which are brothers that sent a western union money order for a deposit on a pup to the Brooklyn New York location and UPS sent the western union back because they told Jordon that they don't deliver there No more because to many people have been Ripped off. Both Jordon and Blake are on our second Happy New Owners page and third Happy New Owners page. These people have been in business for 20 years and they know that a 3 or a 5 year health guarantee turns people on to them. They are now brokering mini and standard bull terriers and they are under a new name which they have changed there name Six times to date. And now their asking for references in their ads. And one of there advertisements says he has been breeding for close to 20 years. They have many different advertisements. But the truth is brokering for close to 20 years. The Red Flags should Fly!!! This man and woman will tell you exactly what you want to hear but, They are not breeders like they will tell you. They are brokers of pups from third world nation's and most pups are non akc registered, Just ask Jeremy of Wisconsin 920-229-5365. His first pup died and now his second pup ( replacement pup ) is deaf with a 1 inch over bite which is tearing up the roof of her mouth. Yet this man told Jeremy everything Jeremy wanted to hear. Jeremy now has $ 1600.00 into the first pup ( Dead ) and her replacement pup ( Deaf ). Anybody offering non akc registered pups. Be very careful and there is a reason why there not akc registered. Jeremy also provided several links ( 6 Breeds ) to all of the Imported breeds that this man and women are Brokering, Not Breeding. Brokering!!! Imported from other Countries. These people are disguised as breeders but are actually Brokers. They are Brokers of many different breeds but you only see there bull terrier advertisement, You only see what they want you to see. They have multiple breeds they are Brokering but you won't see there other avertisements because they want you to think they are only breeding and selling the breed your interested in. But there e-mail address are the same most of the time but they can't hide there phone number. Yet they will lie to you and tell you they are breeders, like they did Jeremy. ( 2 ) Then there are others that are selling pups real cheap in Texas with multiple breeds being offered and all are in a outside building in racks, stacked in like building material . These people are determinng the age of some of his adult females by there teeth!!! Scary huh!!! With some having papers and some not. And none being akc registered. The Red Flags should fly!!! If the price of a pup is cheap, that should alarm you and remember. If it's to good to be true, it's not true. cheap prices bring non akc registered pups coming from puppy mills in very disturbing environments. Inbred style Baby !! Remember you get what you pay for!! $ 599.99 will get you an inbred from a puppy mill and a non akc registered Mess!!! Last Update February 15, 2007. 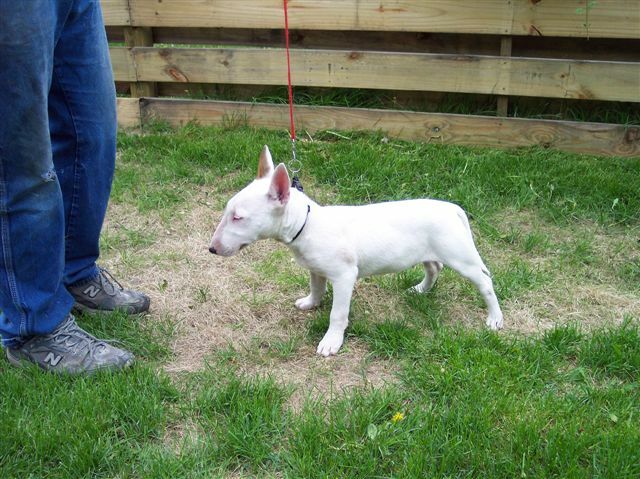 It has come to the attention of the Bull Terrier Club of America that a link to our web site is on your Backwoods Bull Terriers "Puppy Mills - Brokers" page. While we appreciate and share your concern for the huge problem of wholesale brokering of litters, the BTCA Board of Directors must approve any links to our site. Please remove this link until you have requested and received our permission. Inquiries can be sent to me at the address below. This is Jeremy's deaf replacement pup.